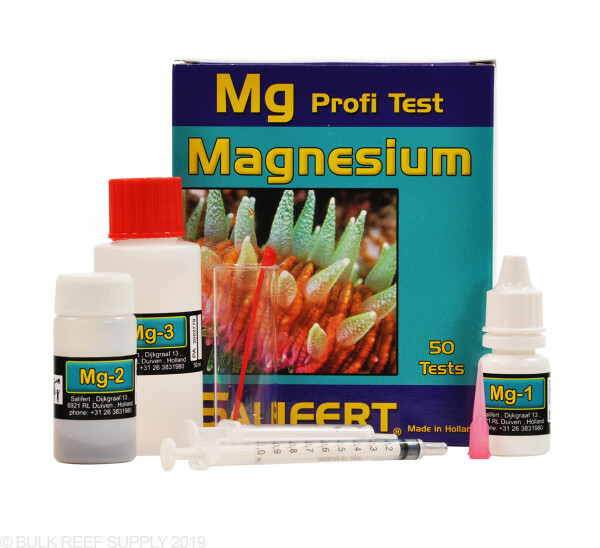 Easily test the magnesium level in your tank. Trusted by discerning reefers for years, Salifert Test Kits feature some of the easiest to read results available to each testing method. 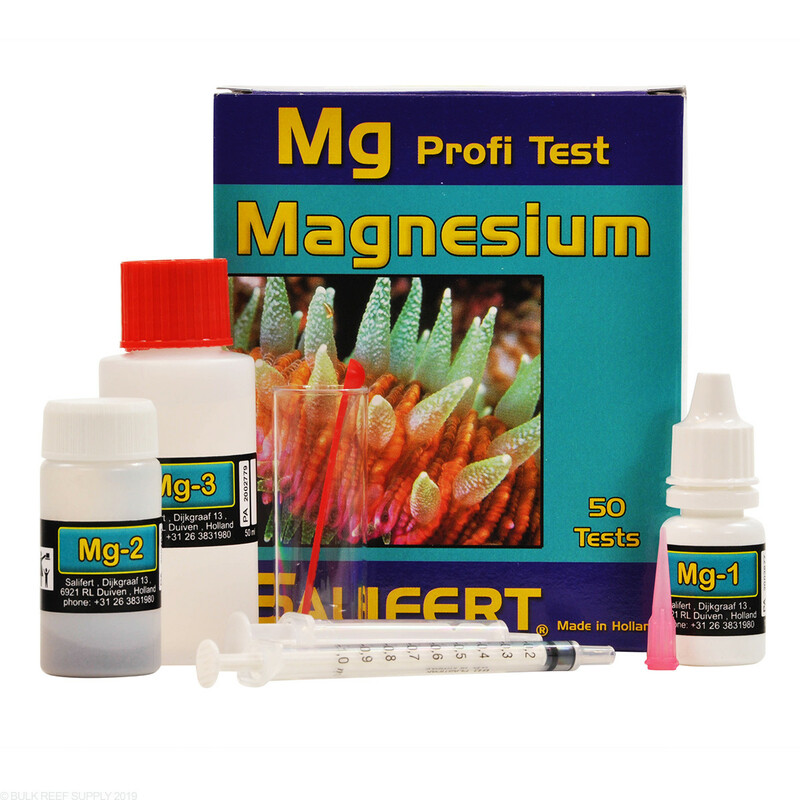 The Salifert Magnesium Test Kit contains 50 tests. This is one of the Salifert kits I have and it works great like they all do. This is my go-to test kit for Magnesium. I have not idea how accurate it really is. When I start to see calcium carbonate accumulate on my pump impellers and heaters, this kit tends to verify low Mg readings. I then dose a calculated amount of magnesium to raise the Mg level to a predetermined amount and re-test with this kit. The Salifert results tend to be within 4-6% of what I calculated the result to be. I do really like the simple method and the sharp color change (purple to blue). If you are blue/red color blind, this test might not work for you (I would imagine). ive used a few other test kits but saliferts is by far the quickest,easiest most accurate test kit out there. it takes only a few minutes when im ready to use the regent ill add a few extra drops instead of a drop or 2 at a time knowing where about my magnesium level is gonna be after i get down close enough and color starts changin i only add 1-2 drops til itreal close to the color should b for the mag reading. til another test kit comes out thats just as accurate and pretty much as simple ill keep using this test kit! This is, without question, the best magnesium test kit around. The test is easy to perform, the endpoint is easy to detect to the exact drop, the results are reproducible, and most importantly, they are quite impressively accurate, time and again coming within 3% of the professional lab spectroscopic value. Red Sea, Elos, Nyos, Giesemann; none of these perform as well for magnesium. I highly appreciate repeatable results and this test has accomplished that for me. Its cheap, easy enough to perform, and seems accurate. 5 Stars. I bought a new kit (expiration 01-2020) and compared readings from my previous one (10-2018) that I was out of the first component MG-1 and it reads from 1315 ppm to the new one 1500+ !! Tested twice to make sure because I couldn't believe it. I guess I have to by another brand to determine which one is wrong. I'm dosing alkalinity, calcium and magnesium. Great product and easy to use as most salifert kits are! Fairly easy to use and has decent expiry so that it's good for Mg that you may not test very often. Salifert test kits are well respected in the industry, only Hanna checkers come close, and they're only worth the extra cost for parameters that are checked more frequently in my view.